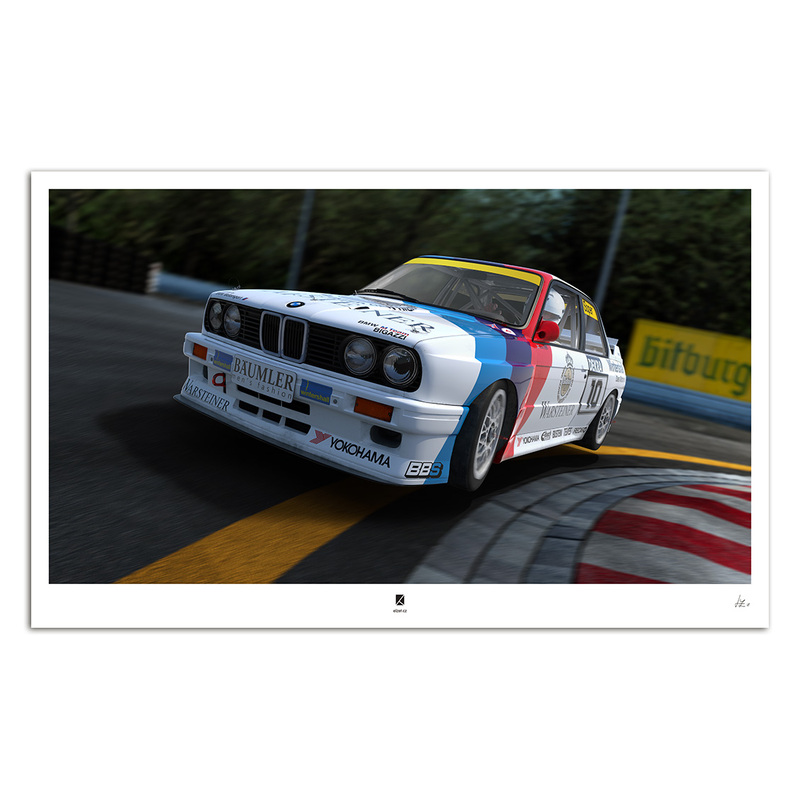 84 x 54 cm, high quality print showing Steve Soper’s BMW E30 M3 #10. JUST FINISHED – PRINTS COMING SOON! This is not a poster, it’s a time machine allowing you to go back to the golden era of touring car racing. Specifically, to the 1989 when of Steve Soper’s E30 M3 raced it on the Norisring, among other circuits. This poster was made using painful handmade, bit-by-bit reconstruction of the original car in a computer 3D software. The same process was applied to the location – famous Grundigkehre (Grundig Turn). Another legend, Czech kart pilot Mikuláš Dula, posed as Soper’s double during a photoshoot with talented Tereza Oršulíková. All three of us had a great fun on location near Prague taking the stills! Both the renders and photos were then retouched, adjusted and composited into the final image. For detailed explanation of the creative process behind this poster, read the E30 M3: the process page. The poster comes in size 84 x 54 cm, printed on high-quality photographic paper (325 gsm) and is not framed. It will arrive carefully rolled in a tubular package.